Environment and mother nature is looking for an initiative by everyone to sustain the good within them. “Going green” helps us in saving and sustaining the environment. Its all about practices that can take us to much more environmentally friendly and ecologically responsible decisions and lifestyles, and helps in protecting the environment and sustaining its natural resources for current and future generations. Go green is fast becoming the way of life and people across all walks of life are participating to save the planet by doing their bit. Green is also fast becoming the way to celebrate all festivals such as Ganpati and Navaratri, which every year see millions of idols being immersed in the local water bodies. Celebrities and brands have come together to promote the sustainable way of celebrating Anant Chaturdashi this year. Many people opted for idols made of clay instead of PoP to ensure keeping their environment safe. The clay idols albeit heavier than the PoP idols, dissolve easily in the water bodies without leaving any toxin and harmful effects to the marine life. Use the clay Ganesha to save the earth from the pollution of harmful chemical substances. These idols made from red soil and fertilizers, come with plant seeds inside them. These eco-friendly idols dissolve to become plants. These are not taken to pond for immersion but watered until they dissolve and seeds begin to sprout. Maharashtra Education Minister, Vinod Tawde came home to celebrate Ganpati with a similar idol made with red soil, organic fertilizers and clay filled with seeds of plants. Many devotees have started to collect the offerings of flowers, garlands called Nirmalya and other organic material collected during the Puja and put them in a community built compost pit instead of throwing them in water bodies. This compost can be used to fertilize your garden. Anushka Sharma and Varun Dhawan are endorsing Green Ganesha and eco-friendly celebrations. Actor Shahid Kapoor has joined the students of Lala Lajpatrai College to encourage install eco-friendly Ganesh idols and adopt green immersion practices. Celebrities like Amitabh Bachchan, Madhuri Dixit, Arjun Kapoor, Nimrat Kaur, and Dia Mirza stressed on the benefits of going green this festive season and working towards a greener tomorrow. The cultural capital of India, Pune is all set to say goodbye to Ganpati in a green fashion. 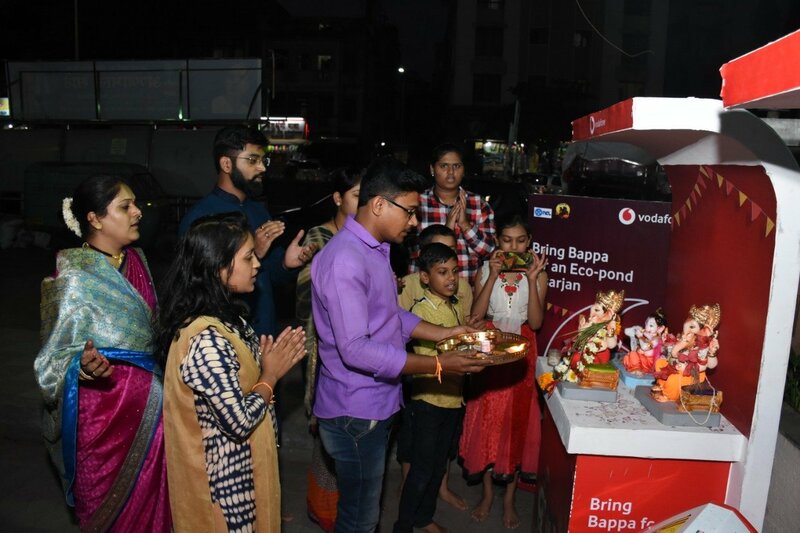 Vodafone Idea in partnership with the Pune Municipal Corporation (PMC) and National Chemical Laboratory (NCL) has set up 7 Eco Ponds across 7 Vodafone Stores in Pune city at NIBM, Wakdewadi, Aundh, Kharadi, Baner, Kalyani Nagar & Chinchwad link road for green immersion of PoP idols used in the households. 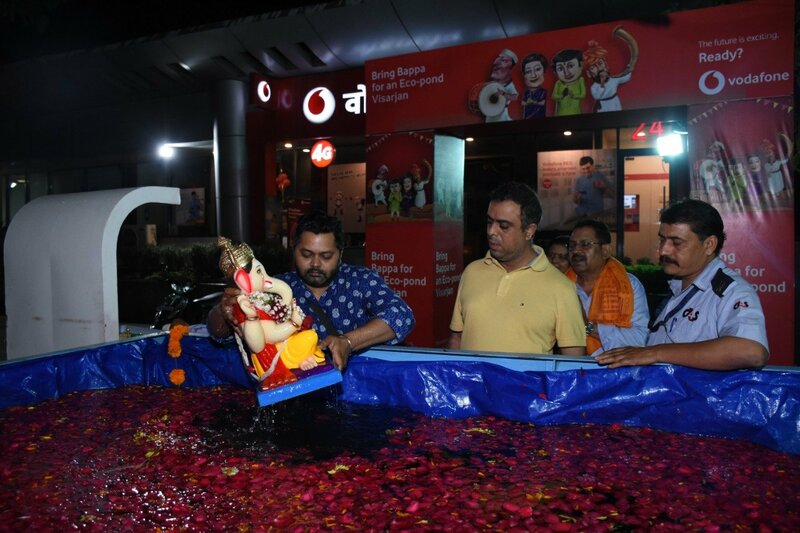 Devotees can also search for the closest ‘Vodafone Eco Pond’ by using Maps or dial 7391000000 for information on ‘Vodafone Eco Ponds’ locations. The eco-ponds help to convert the toxic PoP into fertilizer, which is then distributed to farmers across Maharashtra. In 2017, eco-ponds helped recycle 13 tonnes of PoP and generated 1 lakh liters of fertilizer. 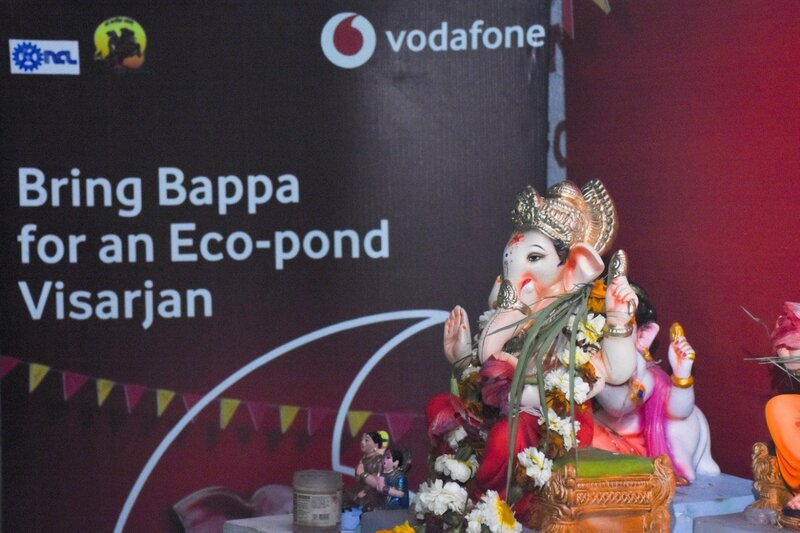 In addition to the fixed eco-ponds, 4 mobile ‘Vodafone Eco Ponds’ have been introduced in 2018 to enable housing societies to utilize the facilities better. These mobile ponds will help them carry out visarjan in an eco-friendly manner. Technology and grassroots appeal can help us save the planet and reduce pollution keeping our festivities intact. So, this festive season let’s say a Green Goodbye to Ganpati. Wow, that’s what we need it. Loved the idea of Tree Ganesha, which dissolves to sprout into plants. How sustainable and environmental friendly these ideas are. Hope people become aware of these ideas. I am happy to see that with every year, more and more people are choosing to celebrate the Ganesha festival eco-consciously. I’m sure your article will help a lot of people understand how to follow eco friendly practices. 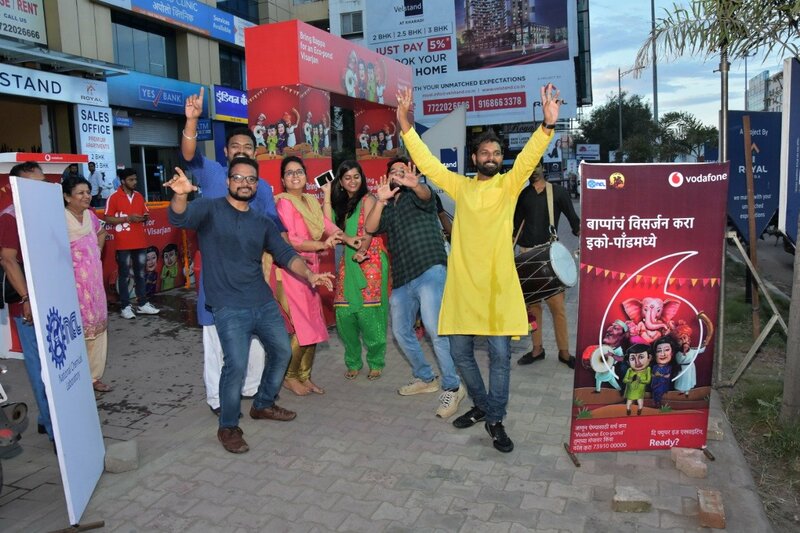 Matter of the fact is that Pune has always been the place where Ganesh festival is celebrated in the most authentic style. One should see it at least once. Great post! Didn’t knew about Tree ganesha. That is revolutionary in my opinion.